The summer of 1997, after spending nine years abroad, I returned to Nepal for a longish stay. I did some odd jobs in addition to teaching. For a while, I even held down a few jobs at the same time. 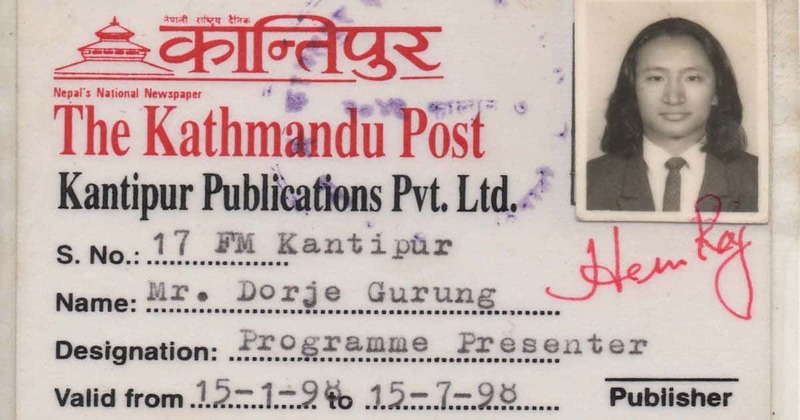 One of the things I did — in the Spring of 1998 — was to host a radio show on the only FM station in Kathmandu at the time. So I did…make all kinds of social commentaries. I talked about all kinds of things, events, people etc. On the March 30 episode, my commentary was about an article published that day in Kantipur. The article was about the plight of a group of Nepalese migrant workers in Malaysia! Reproduced below is the transcript of that hour. Hey hey hey…. Awe right…. You know what time it is! It is time for Marlboro Music Network here on Kantipur FM. And this is Dorje. I have a question this hour; a couple as a matter of fact. How long before the government takes steps to protect the Nepalese people who are tricked into accepting job placement abroad to find that they have been cheated? How many will have to suffer such injustices before steps are taken? While you ponder over those questions, here are…. …. On the last page of today’s issue of Kantipur, I came across a report by Ram Prasad Dahal with the heading ‘Nepalese Workers in Malaysia Return Home due to ill-treatment.’ Details after…. …. Two job placement agencies in Kathmandu, the articles alleges, had arranged for a total of 300 workers to go to Malaysia. Each had paid from 90 thousand to 1 lakh rupees, and had obtained a two year contract to work in factory in Malaysia. Out of the 300, 200 (two-thirds) of them had been illegally smuggled to Malaysia through India. On March 17, seven of them had returned with stories of breach of contract and mistreatment. More about that later, stick around. …. …. The first of the injustices they suffered was that of the Malaysian agency not respecting most of the agreements that Nepalese laborers had made with the Nepalese agencies. When the workers went on strike, apparently they were threatened and given lower wages. As if that wasn’t enough, forty-six of those who had decided to return to Nepal, were arrested by the Malaysian Police at the airport alleging them of being illegal migrant workers. They were imprisoned for three months. More about that after…. …. It appears, from the write-up, that those laborers were supposed to have been issued work permits in Malaysia, but, though I sympathize with the plight of the Nepalese laborers, come on, what country would issue work permits to illegally smuggled workers? According to those who have returned, most of the Nepalese in Malaysia want to return, but can’t because they neither have the money for a ticket home nor travel documents for a safe passage out of Malaysia. And what is the Nepalese government doing for them and others in similar situations? Before that a couple more songs. …. …. The government it seems were alerted of all this and someone from the Labor Ministry went to Malaysia but nothing really was achieved. And the report quotes a government lawyer as saying “The government is doing all it can.” The lawyer further went on to point out that most of the workers went there illegally. However, there were no comments on what actions would be taken against the offending party—the job placement agencies responsible for tricking the Nepalese laborers and taking them to Malaysia illegally in the first place. My question is when will they? How many more will have to suffer before the government takes action? Apparently there are a host of such Manpower companies specializing in providing Nepalese laborers to companies and factories abroad, notably the Middle East. Stories such these are rampant!! How long will the government continue to cast a blind eye to this? …. That’s it for this hour. Time for Udayashree Top Ten with Savita. Tune in again tomorrow at seven. This is Dorje signing off. Good night. If you have been following the stories of the plight of Nepalese migrants, you know the answer to the questions I posed then. Incidentally, Malaysia has the highest number of Nepalese migrants and records the highest death rate. Depending on the source, the current rate of Nepalese migrant workers arriving at Kathmandu International Airport in coffins is 3 or 4 per day.